Editor’s Note: Read The Atlantic’s special coverage of Martin Luther King Jr.’s legacy. 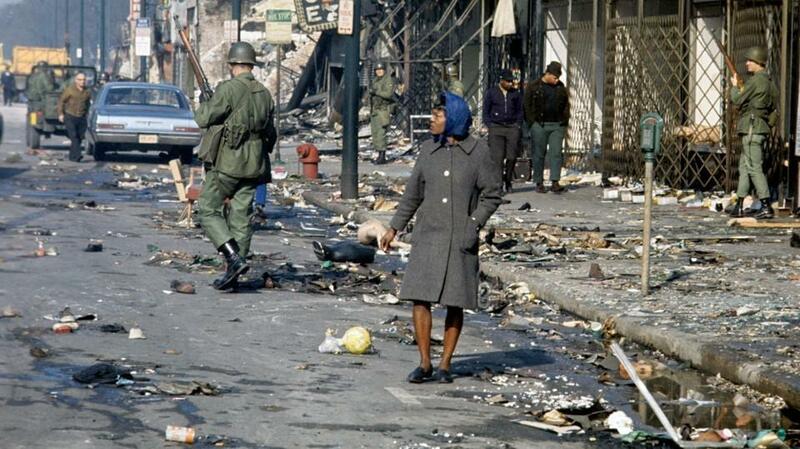 Image Above: Three days after King is murdered in Memphis, soldiers patrol riot-torn Chicago. “Woe to you, because you build tombs for the prophets, and it was your ancestors who killed them.” Jesus’s rebuke to the Pharisees descended upon me on a cold January morning in 2017, in West Potomac Park in Washington, D.C. On that Monday, the national holiday dedicated to the man at whose memorial I stood, the capital bustled in anticipation of a more pressing political event. That’s why I was at the park, pondering this granite stone of hope, carved out of a mountain of despair. The memorial to Martin Luther King Jr. cast its shadow over me, its presence just as conflicted as those tombs. As sure as Jesus’s words proved prescient about the adoption of Christianity in the empire that killed him, so too the modern-day legend of King writes itself in real time. In the official story told to children, King’s assassination is the transformational tragedy in a victorious struggle to overcome. But in the true accounting, his assassination was one of a host of reactionary assaults by a country against a revolution. And those assaults were astonishingly successful. Yoni Appelbaum and Ezra Klein debate whether Democrats should open an impeachment inquiry into President Trump.